From a distance I could make out that there was some big company signage across the front of the building. “Nice,” I thought. I can’t quite make out what it might’ve said but I think i’ll head back there and see what I can work out. Then when I got closer I spotted that awesome script type above the roller door. “Niiiiiice!” You can also make out some impossible-to-interpret lettering faded right into the background there, too. There are a few things that can be made out here. 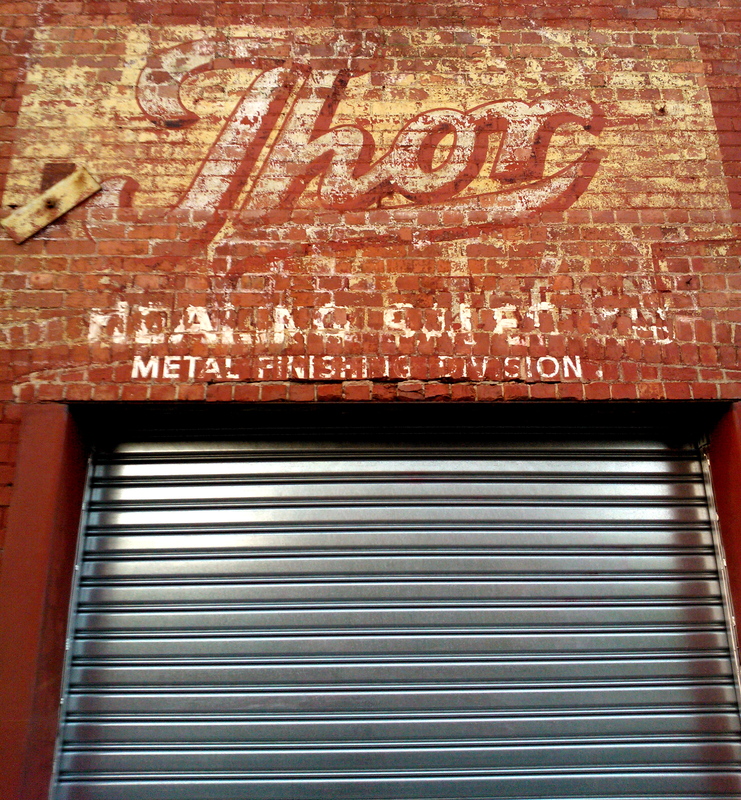 “Thor”, obviously, and “METAL FINISHING DIVISION”, is quite clear. Also what looks like the word “HEALING”. 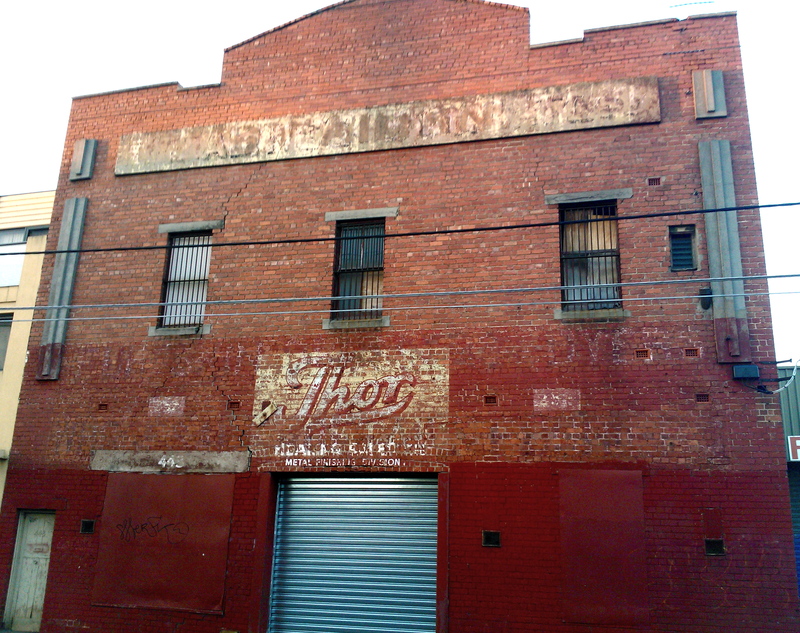 Well, after a little google-fu work, I found that it was a company called Healing (Sales) Pty Ltd that used to occupy the building. 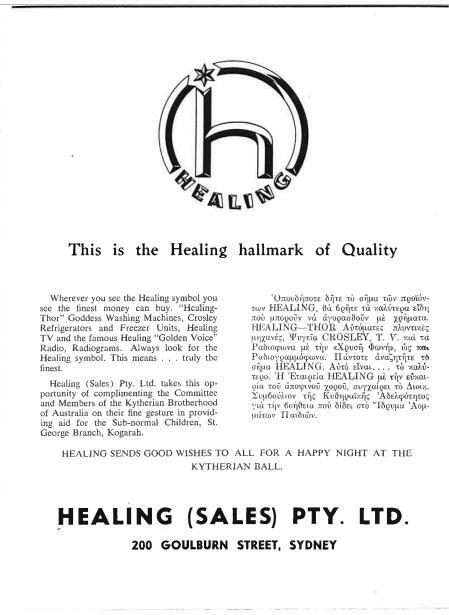 The company was founded by A.G. Healing as a division of A.G Healing Ltd, which was originally set up for importing and selling bicycles in 1868. 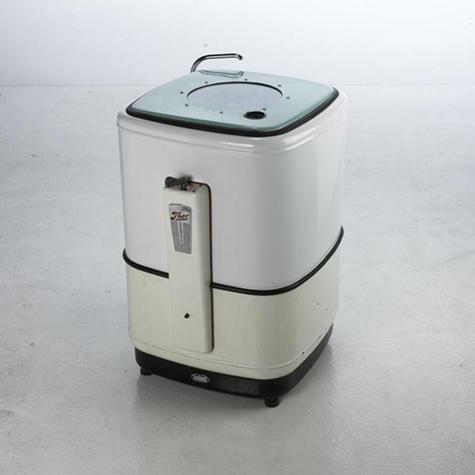 In 1956 the company formed an alliance with American company, Dumont, and went into the manufacture of washing machines, under the brand Thor, and fridges under the brand Crosley, amongst other things. Here’s some pics and reading material for y’all. 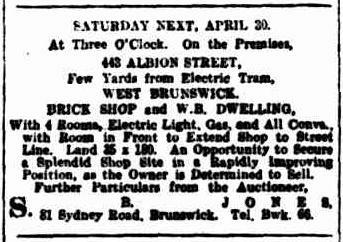 Other info I found on the company include law documents for their case vs Inglis Electrix Pty Ltd (I don’t really understand it at all but you’re welcome to look into it here,) and a listing of licenses and permits issued pursuant to the poisons act, 1962 from the Victorian Government Gazette No. 2, Jan 7th, 1966. It seems they were “licensed to manufacture poisons or deletrious substances (other than drugs of addiction)”. BAM! 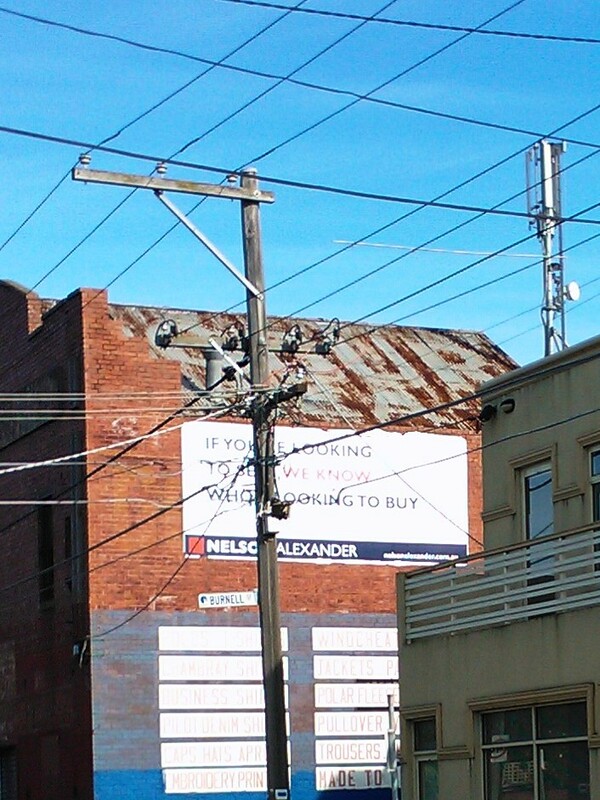 … Why, I believe it’s an enormous Robur Tea ad on both sides of the roof. 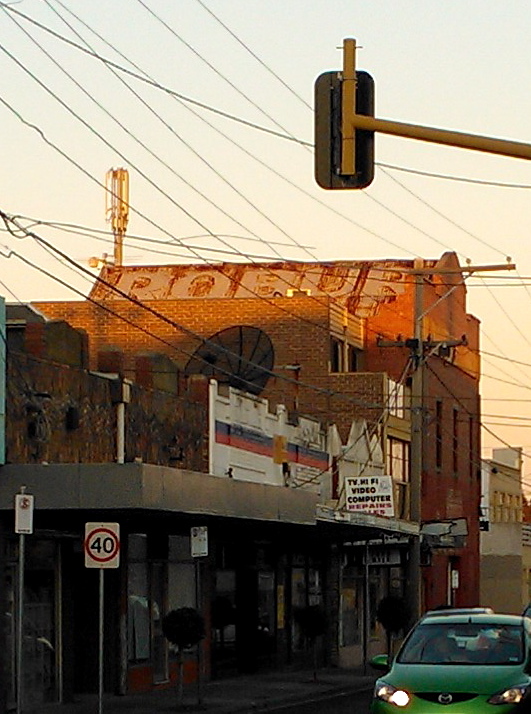 Why they felt the need to paint a huge sign right up on the roof of a factory, I don’t know. I couldn’t imagine the passing helicopter traffic being that high, but who knows, maybe back in the day the small single engine airplanes would be coming in that low as they headed out to Essendon Airport?? Tags: Factory, Robur, Tea, Thor. Bookmark the permalink. 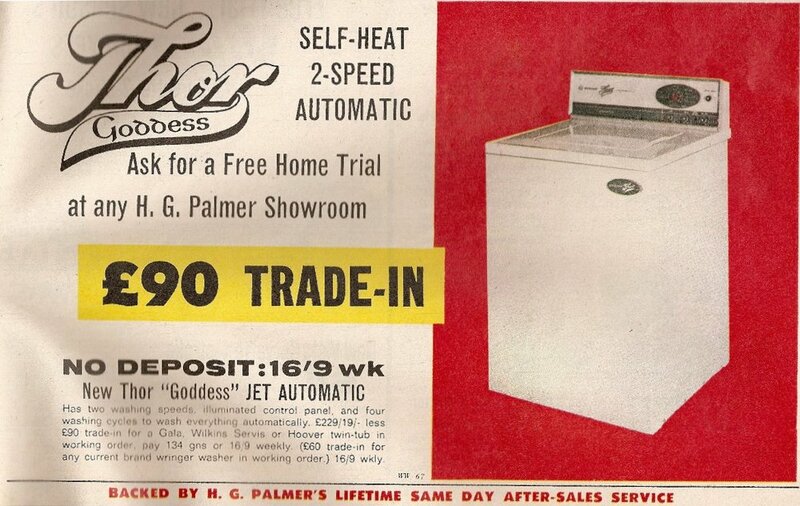 The Thor automatic washer has a setting clothes, and a setting for dishes. This may be the greatest appliance ever. I must posses it. 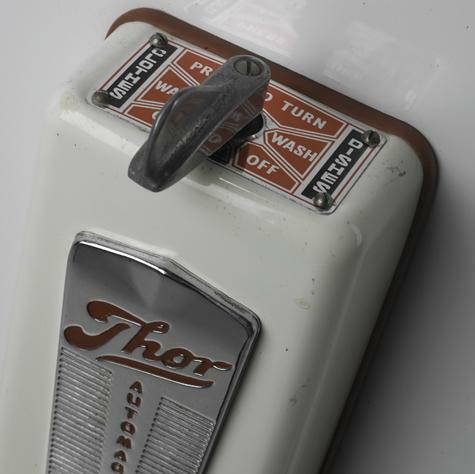 The Thor automatic washer has a setting for clothes, and a setting for dishes. This may be the greatest appliance ever constructed. I must possess it. There’s video of the dishwasher floating around youtube too. It’s very clever. It uses the agitator motion to flick water upwards on to the dishes.